At the Easter Gathering we all took turns at being (a) the teacher and (b) a student. Consequently all of us learnt new skills and techniques which we hadn't known before. 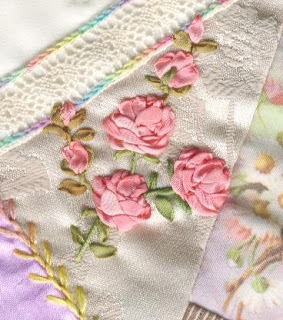 Julia taught us how to do "Melanie Roses" using 4ml silk ribbon. This is a block which I am working on for myself and these are my first attempt at Melanie Roses. I am really glad that Julia chose to teach these as apart from being very easy to do, they look totally true-to-life. these are my favourite roses to do now..
Gosh, another thing I missed out on ..... just need to learn how to do those beautiful roses ..... they sure don't look like first timer to me ..... super job on those Viv.